When your septic system is properly cared for, you will be able to extend the life expectancy of your sewage system. In addition to extending the life of your septic system, you can also save on maintenance costs and even help to protect the water quality of your system. It does pay to perform preventative maintenance, and you can do this by following some simple tips on how to care for your septic system. Caring for your septic system can be broken down into two parts. The first consist of how to maintain your septic system and keep records of your system. The second includes a list of things that you can do between maintenance in order to keep your septic system working at its optimal best at all times. The first thing that you need to remember for your septic system is to keep accurate records. A diagram of your system’s location along with detailed records allow you to keep a maintenance log that can be used for new owners in case you move and can be shown to any company if they need to work on your system. These plans will help you to plan your landscaping so that your septic tank will remain accessible at all times. It also saves time for any work that needs to be done on your septic system as workmen can locate the area they need quickly and efficiently. All diagrams should be kept with maintenance records so that all information can be located whenever it may be needed. An inspection of your septic system should be carried out by a professional company on a yearly basis. Regular inspections will help to prevent any problems from forming and can prove to be cheaper in the long term. Inspections will also tell you if you need to pump out your septic system less often or even more often. An inspection will include a visual inspection and measurement of all scum and sludge in the septic system. The scum is created by grease and light solids that float on top of the tank. Sludge is heavier solids that tend to settle near the bottom of the tank. The sludge and scum levels will show how often the system should be pumped. Pumping out the septic system should be carried out every three and five years. Regular pumping, ensures that your system is working efficiently and can help to prevent any flow problems. Each inspection and pumping should be recorded in a maintenance log. This will help the professional to see when your system was last flushed or last inspected. If you do have any problems with your septic system, it is important to try not to tackle the problem yourself. Instead look to calling a professional who can get your system up and running without causing any further issues. There are further things that you can do to help keep your septic system running efficiently. 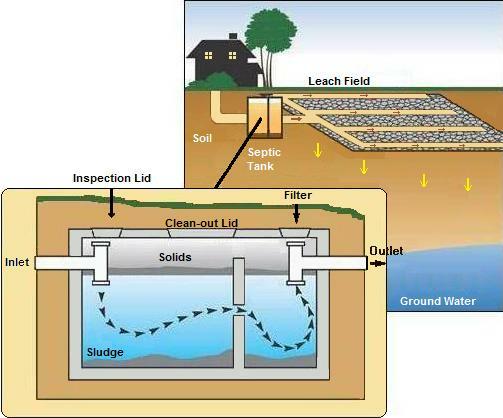 When following the above tips, you can make sure that your septic tank remains free from contamination. These tips will also allow for easier access for any work or repairs that may need to be carried out on your septic system. Caring for your septic tank does not stop with the drainage field as there is much you can do inside your own home to help prevent any damage to your septic system. Avoiding some products will help to keep the water flow of your septic system flowing efficiently. If any of the above items find their way into the septic system, they can prevent bacteria from breaking down the sewage in your septic system and cause costly damage to your system. The avoidance of these materials will not only help keep your septic system in its best condition but it is also less harmful to the environment. Check out our recent article on “Common Causes of Clogged Drains in Your Home” for other tips. Proper care and maintenance will help to keep your septic system running smoothly and problem free for longer than the life expectancy of your system. Detailed records will show where your system and all the parts are without having to dig up and ruin your yard. Keeping detailed records will also help to pinpoint what issues need to be looked at and can help you to save money by pointing out a small issue before it becomes a big costly problem. By avoiding any bio products, toxins, and chemicals, you will make sure that the bacteria and the oxygen levels work to break down the solids in your septic system. This will help to improve the quality of all water flow and help to prevent any blockages and extra pumping. Keep your septic tank system running at its best by taking proper care to maintain and inspect the system regularly.